The Modern Ms. Marvel for a New Audience – LILY & GENEROSO 4EVER! Thanks to Samantha for sending me something that I would not necessarily read on my own. 2014 has been an interesting year for women in comics, and I must admit that a lot of the new series to emerge are not ground-breaking or intelligent in their discussion of gender and are in fact somewhat irresponsible in their lessons. However, Ms. Marvel is the exception to the trend. Ms. Marvel bypasses the common complaint of the absence of redeeming females in superhero comic books to address something even more rare in superhero narratives: cultural minorities. Kamala Khan is a 16 year old Pakistani-American Muslim girl living in present day Jersey City. As a teenager, she has fairly normal societal teenage pressures, but her path to adulthood is a more difficult and tumultuous one with the additional burden of her parents’ cultural and religious expectations for their only daughter. Consequently, as with many young females who come from cultures that have restrictions on women contradictory to those of their Caucasian American counterparts, Kamala has a bit of an identity crisis; she does not want to reject her Pakistani heritage, but she is also American, and the two cultural expectations for young women don’t play well together. What does not make this identity conflict any easier is the fact that Kamala does not fit it with the Caucasian teenagers at her school or really even her Muslim friends. She’s stuck somewhere in the middle, and it seems like the only other person who understands her is another fellow child of immigrants, Bruno Carrelli. And to make Kamala’s attempt to understand herself even more difficult, she suddenly gains superpowers one night as she wishes that she did not have to be Pakistani. In return to her wish, Kamala can suddenly morph into the All-American superhero Ms. Marvel with big blonde hair, a Ms. America physique, high-rise boots, and the ability to transform into various sizes with super-human strength. In her Ms. Marvel form, Kamala can choose to entirely reject her Pakistani roots, but this cultural dismissal does not always work out the way she expects. Beyond Kamala’s emergence as a superhero, the action of Ms. Marvel Volume One: No Normal focuses on Kamala’s task to save Bruno’s younger brother, Vittorio, from the damaging and potentially fatal influence of some unknown villain known as the The Inventor. In the process of trying to save Vittorio, Kamala must understand how to use her powers, which are out of control when she takes on the All-American heroine Ms. Marvel form. Consequently, the unwieldiness of this stereotypical Ms. Marvel transformation provokes Kamala’s simultaneous development of her cultural identity as an American and a Pakistani woman and her identity as a superhero. By the end of the first volume, when Kamala emerges as her own Ms. Marvel, she has a darker complexion and a name very different than “Mary’” or “Jane” and is much more clothed and a much less buxom. Kamala’s Ms. Marvel integrates her American and Pakistani cultures, and in parallel, in her regular life, she also combines both cultures and becomes more comfortable with her ethnic identity, even if it differs from the people around her, because after all, what’s more alienating: superpowers or being Pakistani and Muslim? In one moment Kamala battles a robot in a garbage dump in her own, individual costume. In the next moment, she must change into shalwar kameez for her cousin’s wedding procession. Though Kamala is a little in over her head with her obligations as a teenager, a daughter, and a superhero, her new-found superpowers galvanize the growth and reflection that she needs to decide who she wants to be in all parts of her life. Bravo G. Willow Wilson and Adrian Alphona. You two have created a superhero that has a distinct identity relevant to the second-generation immigrant experience. I commend you both on your adaptation of Ms. Marvel for creating a hero for today’s non-homogenous America for an audience previously unaddressed and unengaged in superhero narratives. Kamala Khan is a superhero I wish I had as a Vietnamese American teenager, and I am so very grateful that she now exists for adults and for today’s youth. The modern Ms. Marvel is a superhero unlike the white audience tailored ones such as Superman and Wonder Woman who are crafted from centuries-old Western archetypes. Ms. Marvel has the same noble intentions to save the world, but she finally has a personal story that we second-generation immigrants can empathize with in contemporary times. 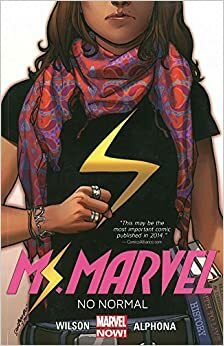 Ms. Marvel is written by G. Willow Wilson and illustrated by Adrian Alphona. Volume One is now available via Marvel Now!